This article was updated on 12/20/18. If your workshop is small like mine, every square inch is prime real estate and you have to get creative about organization. 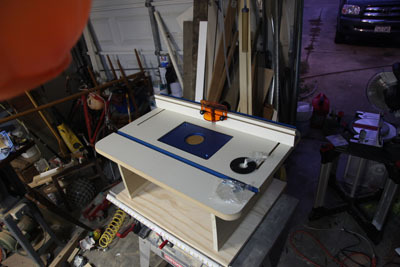 Ive always wanted a good router table but I never was happy with the little one I bought at Home Depot, so I decided to build my own. This home-built table has a small footprint, so I can set it aside when Im not using it. When I need it, I can just set it on top of my table saw or the tailgate of my truck. I didnt build the table top itself; I ordered the top and fence from Rockler Woodworking and Hardware; it was the best deal I could find for the excellent quality. The top features a high-pressure laminate surfaces that sandwich a 1-1/8 thick MDF core for a flat and stable 24 x 32 work surface. It comes with a built-in aluminum miter track and a 10-point plate leveling/locking system. (2) 1 X 12 X 10. I used poplar since it is a stable but affordable hardwood. (6) galvanized angle brackets (Simpson Strong-Tie® A21Z, although something similar would work as well). 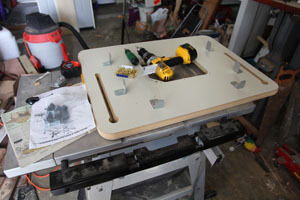 The first thing to do is attach the brackets to the bottom of the tabletop with the #6 screws. There are a couple of things to take note of here. First notice that the box Im building here is only 3-sided because there needs to be an opening in front to allow access to the mounted router. As added bonus, this also allows for a nice, convenient storage space. No worries where the brackets go because the factory has done a nice job of pre-drilling plenty of screw holes. Next, note that I aligned the side brackets to allow free movement of the fence adjustment knobs. The wood on the sides will attach inside the angle of the brackets, while the wood on the back will attach on the backside of the brackets. My logic here is to maximize the area for stability and operation of the router while still allowing free movement of the knobs. Next attach the sides and back. You can see in this photo how the sides attach. The sides are 19 1/2 long and the back is 22 3/4 long. After attaching the sides and back to the brackets, use 4 of the #8 screws to secure the sides to the back (2 on either side). The next step is to attach the base with the remaining 6 #8 screws. Be sure to countersink the screw heads The dimensions are 28 3/8 X 22 1/2. This means using 2 pieces of poplar, although you could substitute plywood to save some money. The table comes with your choice of mounting plate, depending on the brand of router you own. Mine is a Ryobi and didnt match up with any of the standard ones so I ordered the large plate and just drilled my own holes. To mount the router, just unscrew the plastic plate, remove it, and use the same screws to mount it to the bottom of the router table plate. I always pre-drill screw holes. The first drill bit I use is as big as the shaft of the screw, but narrower than the threads. Next I use a bit that is slightly larger than the screw head and go just deep enough to bury the head. Particularly when working with hardwood, I smear a bit of bar soap on the screw threads. This just makes it easier to screw them in without stripping, especially with slotted heads rather than with Phillips heads. from: Rockler Woodworking and Hardware. 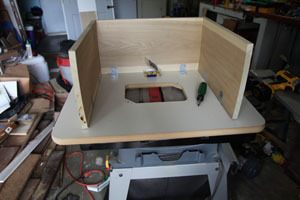 If these compact router table plan for a small wood shop helped you, please pass it on to your friends. If you have any tips, leave them in the comment section. Did you find this article helpful? 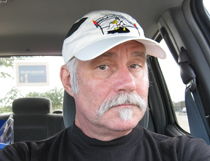 Thanks for supporting this free site with a small donation! We rely on our readers rather than a paywall.